Thankful Thursday | My Crazy Blessed Life! Today for my thankful post I want to talk about how grateful I am for my husband, Eric. 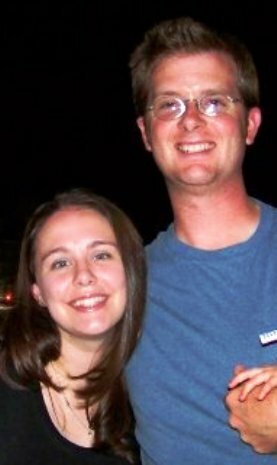 We have been together for 10 years this month, married for 8 years this June, have moved 8 times, lived in 4 states, have 3 beautiful children, and I love him very much. God has blessed me greatly through him. We have grown together, learned from each other, we compliment each others strengths and weaknesses, we make each other laugh, and we love to work side by side in ministry. I’m not saying everyday is perfect or either one of us are perfect, by far that is not true. But, instead we have grown in the acceptance and forgiveness of each others faults. Learning unconditional love for another person who will undoubtedly let you down or hurt you has been one of our greatest gifts of marriage. Eric loves me at my best and when I am at my worst, not many people honestly love me unconditionally like that and its something I treasure. When I’m tired and grouchy (pretty much every morning) he loves me. When I’m sick and throwing up, he loves me. When I’m having a down right ugly cry over something, he loves me. When I get mad over crazy stuff, he still loves me. When I am pulling my hair out over the kids, dinner is late, and the house is a mess when he gets home after work and I just kiss him and lock myself in a room for 45 min, he still loves me! Eric is a man who loves God and does his best to lead me and my kids closer to him. Eric is a man who knows cars, its pretty nice having a mechanic for a hubby. Eric plays just about any instrument he picks up, he is an amazing musician and his guitar playing wooed me :). Eric has crazy pancake making skills! Eric encourages me even when I feel like a total failure. Eric inspires me to be better tomorrow than I am today as I’ve watched him embrace that concept especially over the last year. Eric loves kids, especially ours just seeing how my daughters can bat an eyelash and he will do just about anything they ask. Eric is a morning person, this alone baffles, amazes and makes me happy since he enjoys getting up for breakfast with the kids while I cherish the little bit of extra sleep before he leaves. Eric builds things and fixes things. Eric is my best friend and my love. We’ve been through hard times, but wow was it worth all the good we have together. I’m proud to be his wife. I’m thankful God brought us together, and I can’t wait to spend the rest of my life by his side.